​​Sunrise on Galty Mor, County Tipperary. ​Sunrise on Galty Mor, County Tipperary. If you have Iceland on your bucket list then now is your chance to see this magical island of Fire and Ice. ClimbIreland are running regular trips to Iceland in 2018 from April to October (please see ClimbIreland Trips) for more details. ​Walk, climb or hike in Ireland and see what this fantastic country has to offer. Hike for a day or a week, climb for a day or a week, whatever you do you will see Ireland at its best and make friends along the way. Walking in Ireland you will see the parts of Ireland that can only be seen by leaving the hustle and bustle behind. At Climb Ireland you will be given the personal attention you deserve. So why not make contact with Climb Ireland and start what will be the adventure of a lifetime. 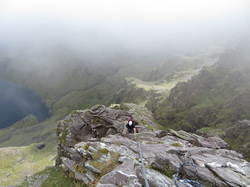 Climb Ireland are a well established family run mountain guiding company. At Climb Ireland our aim is to show you what you can achieve if you are willing to push yourself that bit further. From the iconic Howling Ridge on Carrauntouhill, Ben Nevis in Scotland and everything in between and we are proud of the friendships we make through Climb Ireland.